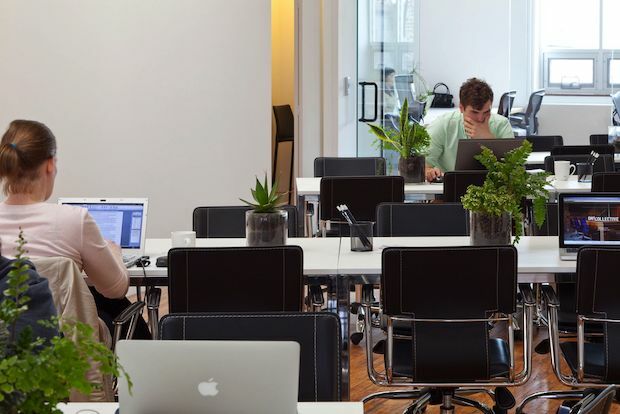 LONG ISLAND CITY — In western Queens, a growing number of shared and co-working spaces are giving solo and freelance workers a place to break out of their work-from-home ruts or escape the crowded neighborhood coffee shop. From an open loft inside an art gallery to a members-only writers club that hosts readings and lectures, Astoria and Long Island City have several options for independent workers. The newly opened QNS Collective is located in a renovated former electrical supply warehouse where founders David Sanders and Argentina Flores said they wanted to fill a niche in the neighborhood. "There's a need for it — there aren't a lot of spaces that focus on creative types," said Sanders, who has a background in design and marketing, while Flores works in web design. "Right now, Starbucks is it in many neighborhoods, and Starbucks isn't the best place to work." Sanders said their goal is to create a collaborative hub for creative workers, where they plan to offer educational programs and workshops. Amenities at the space include a printer, scanner, fax and copier, private lockers, a lounge and library, private call rooms, a conference room and a stocked kitchen with coffee from nearby cafe COFFEED. QNS Collective offers several membership options, ranging from a basic $25 a day to the most advanced membership, which costs $395 a month and includes unlimited use of the space and your own designated desk with storage. A full list of options and prices can be found here. Create NY Space, 35-18 37th St. Create NY Space isn't your typical office. The shared work site, which opened May 1, is located inside The Aurora Gallery, an art and event space in Long Island City. The location makes the space a good fit for creative professionals or "anybody who wants to work outside of the cubicle," according to co-founder Naeema Arrastia, who started the site with partner, Ron Rateau. The two run a marketing firm — The Aurora Gallery is one of its clients — and Arrastia said their vision for Create NY Space was based on what they were unable to find during their own search for a place to work in the neighborhood. "We didn't want a formal office space," she said. "We wanted something that was more geared to the creative process." The Aurora Gallery's owner, Eli Rios, also works in furniture restoration, so the decor includes many antique and restored pieces. Much of the seating is open, though members have the option of signing up for a designated desk. The site is currently open Mondays to Fridays from 10 a.m. to 6 p.m., with weekend hours available on request. A part-time membership costs $125 a month for access to the site twice a week, or $225 a month for an unlimited membership. Local Project, 11-27 44th Rd. The nonprofit art organization Local Project is offering space at its new headquarters on 44th Road in Long Island City, where the group moved last fall because its old space — located in the same row of warehouses as former graffiti space 5Pointz — is slated for demolition. "It was so much work to move and to get to where we are," said director Carolina Penafiel. The site includes a common area with a couch, coffee table, kitchenette, bathrooms and a slop sink, and an office space with two printers, a scanner, sound system, projector and screen, with all equipment available for use upon request. Penafiel described Local Project as a "hub," and said the shared space not only offers a place to work, but an opportunity for someone to expand their network and make connections with other members of the local creative community. "It's very active here," she said. "The creative energy is just incredible." The space is available for $200 a month, or $180 for those who can commit to multiple months. Patrons get their own key. The Oracle Club, 10-41 47th Ave. The Oracle Club was opened in 2011 by author Julian Tepper and painter Jenna Gribbon, who live upstairs from the space. A co-working space for writers and artists, the art studios at the Oracle Club are currently occupied, but applications are available for writer members, according to Tepper. Writers can work in the book-filled library, and members are also free to use the site's salon space "as if it were their own living room," according to the club's website. The Oracle Club also hosts classes and regular events, like book readings and musical performances. "It's a really nice and quiet, beautiful space," Tepper said. "It's easy to concentrate, but at the same time people meet a lot of like-minded folks." Memberships cost $150 a month, and the space is open seven days a week from 8 a.m. to 11 p.m.